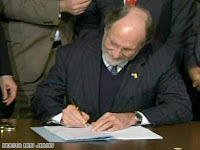 This furry oaf of a man is my governor, Mr. Jon Corzine. You know, the guy famous for not wearing seat belts. And he just went up about a thousand percent in my approval rating. Do you know what he's doing in the photo at left? He's abolishing the death penalty in the State of New Jersey with that little pen. Never let anyone tell you the sword is mightier. I totally agree with you. One thing DNA research has taught us is that there have been and still are innocent people serving time in prison. It's astonishing how many people have been exonnerated with DNA evidence. And even if there is ONE innocent person on death row, there shouldn't be the death penalty.